Imagine you are a patient for a moment. Now, envision a doctor entering your diagnosis and treatment plan into a program that looks like a crossword puzzle. Next, picture a different doctor putting your data into a program that has a simple, uncluttered interface. Both doctors must share your health data with staff members and other providers. Which doctor would you feel most comfortable leaving your medical information with? This thought exercise is an example of usability in healthcare technology. If you work in the healthcare field, you may have had frustrating experiences with technology in your practice. Fortunately, the healthcare industry has realized the importance of usability in electronic health record (EHR) software, and is taking steps forward. Practices do not want to waste time navigating confusing interfaces or sifting through mounds of data. They want more time to care for their patients, and patients want more attention. In response to a growing demand for improved EHR usability, major tech companies have committed to developing healthcare IT tools that work for everyone. 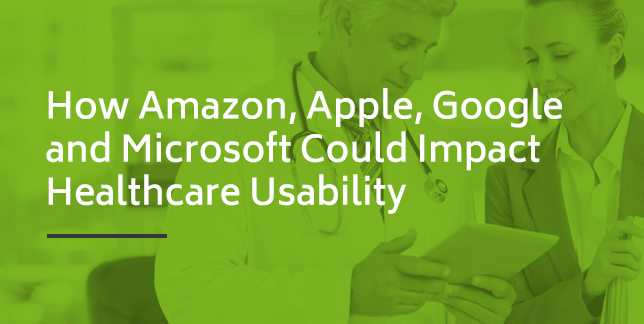 In this article, we will explore the importance of usability and how tech giants plan to impact the future of healthcare IT. Healthcare professionals spend a significant amount of time completing administrative tasks. For example, physicians spend almost two hours on EHR tasks per one hour of direct patient care, according to a study published in the Annals of Family Medicine. Overall, physicians spend more than half their workday using EHR during and after office hours. Administrative tasks relating to health plans, billing and insurance claims cost physicians $83,000 each year. Usability could significantly reduce these costs because billing and interacting with different insurers would be simple and less time-consuming. When healthcare practices have software that is efficient and easy to use, many different aspects of the work environment improve. Here are some examples of usability in healthcare and their benefits. 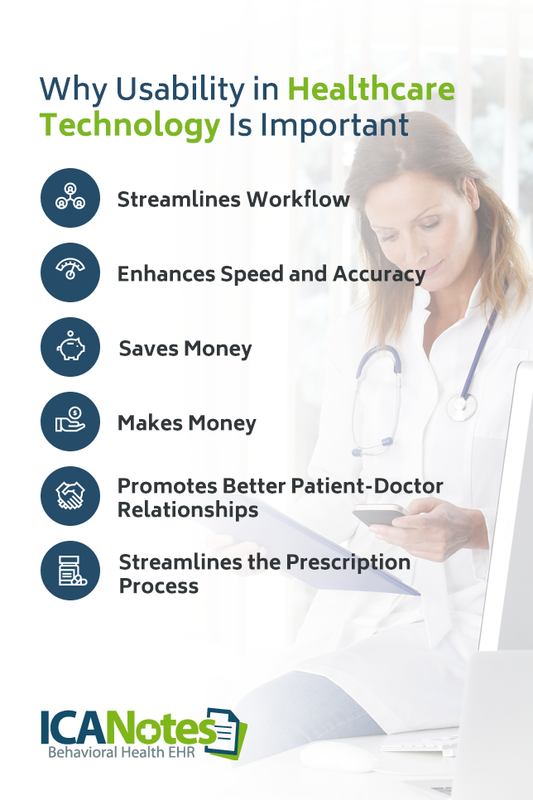 Streamlines workflow: When EHR software is intuitive and designed to meet specific goals, healthcare professionals do not need to spend hours entering data or searching for the information they need, nor do they need to spend excessive amounts of time communicating with other providers or submitting insurance claims. Usability enables staff to seamlessly move from one administrative task to the next, giving them more time to spend with patients. Enhances speed and accuracy: EHR should integrate with other specialties, including pharmacies, laboratories, behavioral health practices and other specialized healthcare providers. When all a patient’s records are neatly organized in one system, physicians can prevent the creation of duplicate forms and communicate with other specialties easily, quickly and accurately. Fewer steps decrease the chance of making mistakes. Saves money: Mistakes cost money because they cause delays and take time to fix. Usability reduces errors because it helps eliminate confusion and miscommunication between workers and other providers. Makes money: High-usability EHR simplifies the billing process and accelerates payment processing. It reduces coding errors which can cause payment delays, and with integrated billing systems, physicians can submit claims and get reimbursed faster electronically. Promotes better patient-doctor relationships: Efficient EHR allows providers and patients to communicate, share information and build a relationship easily. Through patient portals, patients can access their medical history and information, cancel or confirm appointments and be active in their health management. Streamlines the prescription process: Doctors should have the ability to easily send prescriptions to a patient’s preferred pharmacy via an EHR program. Patients should have access to their prescription histories to manage their health better. Usability benefits practices, patients and other stakeholders. Unfortunately, it’s not that simple for EHR designers. Usability must accommodate different specialties, and it can’t suit the needs of only one group. It’s challenging to find ways to improve usability when the technological aspect is so complicated. 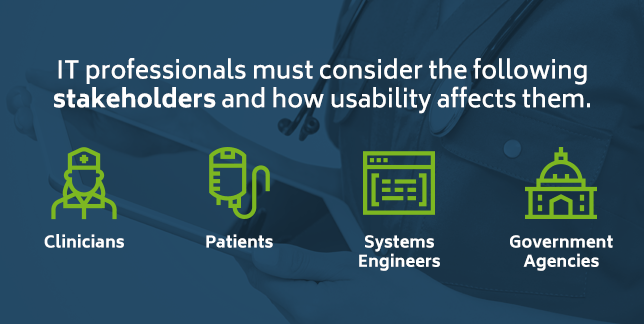 Usability must also be accomplished with security in mind, which further complicates the situation for the creators of EHR systems. Fortunately, large outside tech companies have decided to step in and help. Tech companies are aware of the needs, wants and goals of health industry stakeholders, and they are working on ways to improve usability for everyone. If usability only applied to family medicine physicians and patients, for example, IT professionals might have an easier time designing highly intuitive EHR. However, that’s not the case. Healthcare IT usability must meet the needs of many different stakeholders. Patients want a positive experience, doctors want to provide quality care and tech companies want to grow. Somehow, software designers must make all the stakeholders happy. IT professionals must consider the following stakeholders and how usability affects them. Clinicians: Clinicians want simplified healthcare IT tools. They might choose tablets or smartphones as the devices for their EHR platforms because they allow staff to document information while in exam rooms or on the go. Clinicians also want to spend less time on administrative tasks. Software developers need to consider the role each staff member fills and the time constraints they have within their roles to improve workflow for everyone. Patients: Patients want to be able to easily and privately access their medical history and records anywhere. When patients can refer to medical records hassle-free, they can make informed decisions about their health. Therefore, designers need to consider making EHR that has high usability for patients, whether they are using their phones or desktops to interact with their data. Systems engineers: Tech companies compete to create EHR that converts complex information and capabilities into a user-friendly experience. EHR programs require complicated integrations, which have traditionally minimized the importance of usability. Government agencies: Public health agencies often use healthcare IT that integrates with other agencies or healthcare services outside of the public system. They need usability to monitor diseases, environmental health and other relevant information relating to public health. They can benefit from usability to spot trends and help the overall population. In August of 2018, representatives from Alphabet, Amazon, Microsoft and other big names spoke at the Blue Button 2.0 Developer Conference in Washington, D.C. At this conference, the tech companies stated they are “jointly committed” to helping healthcare facilities adopt new technologies for the sake of interoperability. They propose to improve interoperability and usability through artificial intelligence, the cloud and other tools. Each company is working to find solutions by collaborating with healthcare tech companies and testing new developments. 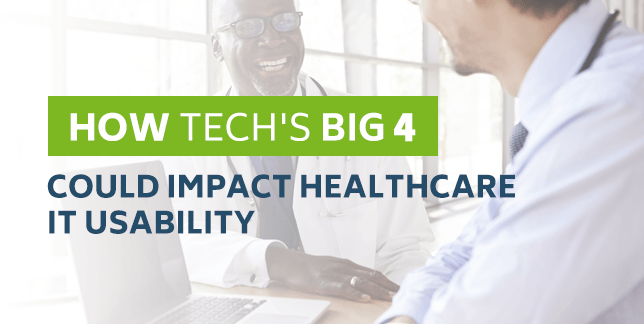 Let’s explore what each tech giant brings to the table regarding healthcare IT usability. Amazon has a formerly secret project known as 1492 which focuses on healthcare technology improvements, including EHR. The team is experimenting with data from legacy EHR systems and exploring other healthcare areas such as delivering and selling pharmaceuticals. They might find ways to increase usability with a voice assistance platform that allows users to access EHR through their voice. Lastly, the group is investigating telemedicine with the goal of developing an easy-to-use platform for virtual consultations. The healthcare industry is not a new realm for Amazon. Not long ago, Amazon partnered with Cerner, an innovator in healthcare IT. In 2017, there were more than 700 million iPhones in use worldwide, and industry analysts expect that number to continue to grow. Apple customers are loyal to the company and are likely to support Apple entering the EHR field, which it is now beginning to do. Last year, Apple CEO Tim Cook said, “Healthcare is big for Apple’s future.” Apple can afford to focus on creating user-friendly designs to enhance patient experiences and outcomes, giving them an advantage, along with customer loyalty and brand awareness, over other companies. Apple is famous for focusing on the user experience. Apple entered the health market in 2014 with the release of the Health app and HealthKit, and in 2015 with ResearchKit and Apple Watch. In 2018, Apple entered the EHR market when they partnered with several hospitals and launched a personal health record feature with iOS 11.3. The feature is called Health Records, and it combines existing patient information from the Health app with data from a user’s EHR if the user is a patient at a participating hospital. Users can see information like allergies, medications, conditions, immunizations, lab results and data they might look at using an EHR patient portal. They receive notifications when hospitals update their data. Information gets encrypted, and users must enter a password to view their records. We are witnessing the earliest phases of Apple and EHR application design. However, for now, Apple is focused on the consumer, not necessarily increasing workflow for healthcare staff. Health Records allows hospitals to share their data with patients, but doesn’t affect EHR usability for clinicians. Though it’s good to know patient information such as allergies and medications, one clinician said, “It’s just more data I need to sift through.” Health Records needs to be more intuitive for clinicians, which might be a challenge for Apple. Google is famous for its search engine and other online tools. In 2017, Alphabet, Google’s parent company, made $110.9 billion. Google has filed more than 186 healthcare patents mostly focusing on DeepMind, its artificial intelligence, and Verily, its health research entity. Google is involved in several health projects developing devices such as Liftware Level, a spoon designed to help individuals with restricted mobility feed themselves, and glucose monitoring contact lenses for diabetics. Google is also focusing on integrating voice technologies into EHR technology to reduce the need to enter patient information manually. In March of 2018, Google announced the Cloud Healthcare API, which connects data from existing healthcare technologies to Google Cloud capabilities and speeds up digital transformations. Google strives to encourage the use of advanced analytical tools and aims to supplement EHR, not replace it. Recently, Microsoft announced it had acquired GitHub, a web-based hosting service, which could help some providers switch over from legacy systems. Many hospitals have already adopted Microsoft Azure because of its level of privacy and security. Also, many healthcare professionals are already familiar with Microsoft’s healthcare tools, which is an advantage for Microsoft. IT professionals who focus on cloud security and performance manage Azure, relieving the burden of security management for healthcare providers. Nonprofit alliances and healthcare interoperability services have shown support for big tech companies and their commitment to improving usability in healthcare technology. Companies such as DirectTrust, CommonWell and Carequality look forward to collaborating with tech giants to come up with solutions. CEO of DirectTrust Scott Stuewe says healthcare interoperability “may be easier to change from the outside.” He says companies who have proven to meet consumer needs related to usability may be in a better position to overcome challenges in the industry by breaking down cultural barriers. Likewise, the big tech companies can benefit from collaboration with establishments that are already familiar with health data standards. This collaboration is expected to accelerate innovation in usability. Usability is vital to patient and physician satisfaction. EHR programs should not be difficult or frustrating to use, and they should always be secure. EHR technology benefits patients and healthcare staff, and reduces the time it takes to document data and communicate with patients. With innovation on the horizon, patients can soon expect to see new healthcare technology that is simple and keeps them engaged in their health. 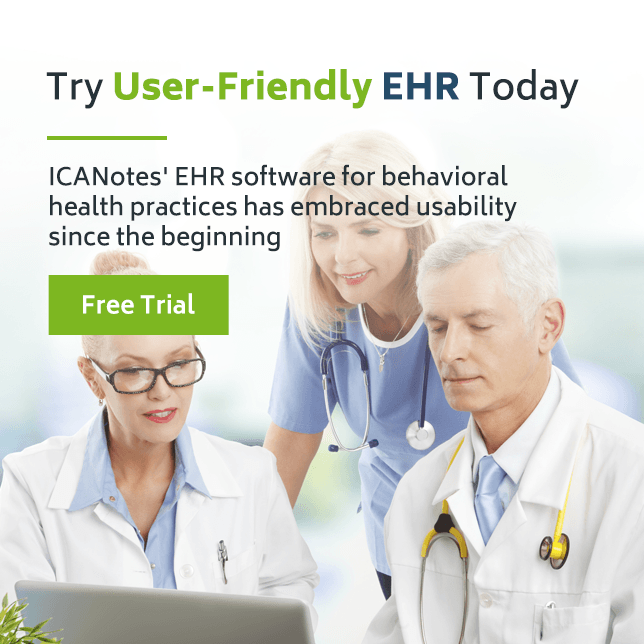 ICANotes’ EHR software for behavioral health practices has embraced usability since the beginning. WIth ICANotes, users benefit from features such as an intuitive, easy-to-use interface, customization options, patient portals and fast, integrated billing. To get started with EHR software that has always put efficiency and security first, sign up for your free trial today!